Dr. Olivero with our MacBook Air winner Tiara R.
We’re excited to announce the winner of our March giveaway. Congratulations to Tiara R! She is the winner of a brand new MacBook Air! 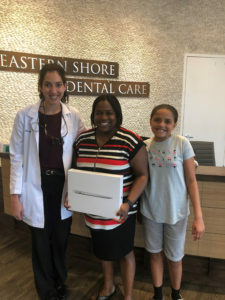 During the month of March, new patients and current patients who referred new patients to Eastern Shore Dental Care in Chester were automatically entered to win a MacBook Air. Tiara referred a friend and her name was randomly selected as our winner. Please join us in congratulating Tiara on our big win! Tiara, we are so excited for you and we hope your new MacBook Air will help you accomplish all your goals in 2019! Interested in being entered to win our next big giveaway? During the months of April, May, and June, new patients and current patients who refer new patients will be automatically entered to win a Yeti Prize Pack, including a hard cooler in the new Reef Blue color, soft cooler, and accessories valued at over $1,000! For complete details, click here. To book your appointment, please call 443-249-8881 (new patients) or 443-249-8854 (current patients).